Are there any of you who have been working too hard? Feeling stress? Do you feel like you can't take one more day of this heat? Or do you find yourself daydreaming about sunbathing on the beach (don't forget the sunscreen) or sailing into the sunset? This probably covers just about everyone in the Phoenix area at one time or another. Well, I have great news. San Diego is just a few hours away. My thanks go to the About Guide to California for Visitors for providing the following feature about San Diego. It doesn't matter whether you are driving over with the kids for a week before school starts, or planning that romantic weekend for two. With these tips and tools, you are certain to have a wonderful and relaxing San Diego getaway. San Diego is one of California's most popular tourist destinations. Its year-round good weather draws visitors from all over and many Arizonans escape the summer heat to vacation there. Visitors of all ages and interests like San Diego, and you can always find something to do. It takes about 7 hours to drive from central Phoenix to Central San Diego. You will need to start on I-10 West and then to I-8 West. If you won't be needing a car, or you are short on time, the flight to San Diego from Sky Harbor International Airport takes about one hour. San Diego spreads over some 300 square miles (514.0 km2). Most of the popular San Diego attractions are clustered along a five mile wide strip near the ocean. Get a San Diego map before you go. Driving times in San Diego are short (except at rush hour) and you can find parking almost anywhere in San Diego, although you may have to pay for it. There are many San Diego hotels (Compare Prices and Make a Reservation) in the San Diego Mission Valley and San Diego Downtown areas, and either makes a fine base for exploring San Diego. Less expensive but still convenient accommodations can be found in areas a little further from the center of San Diego. The San Diego Trolley runs through much of San Diego and past several attractions. However, most San Diego visitors find it most convenient to rent a car and drive. Remember that San Diego is a big city and subject to traffic jams during rush hours. San Diego is a big city and there's plenty to do there for people with all kinds of interests. Try these ideas for a 2-3 day weekend getaway or a week-long vacation. San Diego is one of California's most popular tourist destinations. In recent years, San Diego has become a surprisingly sophisticated place, and it has something to offer almost everyone, from ballet to theatre to zoos. This itinerary assumes that you will leave in the evening, stay two nights and return in the evening of the second day. For example, leave Friday evening, sat Friday night, enjoy all day Saturday, stay Saturday night, enjoy more of San Diego on Sunday, and then head home later on Sunday. Make a hotel reservation in advance (Make Your Reservation) - San Diego's hotel occupancy is generally quite high and you don't have enough time to spend it looking for a place to stay. San Diego is a spread out city and no matter where you stay, you'll end up driving to somewhere. Mission Valley is centrally located, as is Mission Bay. Bring comfortable casual clothing and good walking shoes, your camera, swim suits and beach gear if you want to get in the water. Most restaurants in San Diego accept casual dress, so unless you have a very special evening planned, you can leave your dress clothes at home. Evenings near the ocean can be quite cool, bring a sweater or jacket. The San Diego airport is located midway between downtown and Mission Valley. Collect your bags and rental car and get settled at your hotel. Find a restaurant near where you're staying and get to sleep early - you've got a lot to do tomorrow! Animal lovers, choose between the San Diego Zoo and the Wild Animal Park for today's adventure. As difficult as this decision is, either one is pretty much a whole day adventure and you just don't have time to see both of them in such a short trip. The zoo has baby panda Hua Mei and lots of other wonderful critters, but the Wild Animal Park is more of a one-of-a-kind experience, the closest many of us will ever get to going on a safari. If you're not a fan of animals or viewing them in captivity, spend the day at the beach or shopping in La Jolla. Or, take the trolley down to Tijuana for a south-of-the-border experience. If you still have energy, drive to La Jolla for dinner in the evening, or enjoy one of the many seafood restaurants along the waterfront near downtown. Pack up. Is it time to go home already? Not quite, but you've got to do it sometime. It's time for a taste of San Diego history. Begin your day at Old Town, where San Diego began. Tour the historic buildings, do a little shopping and join a guided tour if one is available. Enjoy your lunch at one of the colorful Mexican restaurants in the area. After Old Town, the Gaslamp Quarter was the next place where people settled in San Diego. It boasts Victorian architecture and lots of walking and shopping opportunities. Nearby Horton Plaza, a thoroughly modern contrast to the Gaslamp's antique charm, offers even more opportunities to empty your wallet. If you skipped lunch at Old Town, try a fish taco at Rubio's, just across the street from Horton Plaza. Now it IS time to go home. The San Diego airport is just minutes north of the historic district. For your additional day, choose two of these three: scenic La Jolla, a bay cruise, or a trip to Coronado Island. Perched on cliffs above the Pacific, upscale La Jolla has shopping of all sorts and lots of good restaurants. If your budget doesn't allow for a dinner in one of city's more expensive restaurants, try visiting it for a leisurely lunch instead, when prices are usually lower. Water and ships are part and parcel of San Diego and its history. Narrated harbor cruises give you a different view of the city and a different perspective on its history. Drive to the Cabrillo National Monument for a bird's-eye view of the harbor, then walk down to sea level to enjoy the tide pools. The bridge to Coronado Island is almost a sight in itself, with its elegant arch over the water. Stop at the Tidelands park for a walk and some terrific skyline views. At the water's edge, you will find a reminder of a gentler time - the Hotel del Coronado. The Hotel "del", as it is affectionately known, has hosted heads of state and movies stars, the famous and infamous. Enjoy the hotel's small museum of photographs and soak in the elegance. You might even run into its resident ghost! San Diego is one of California's most popular tourist destinations. In recent years, San Diego has become a surprisingly sophisticated place, and it has something to offer almost everyone, from ballet to theatre to zoos. This itinerary is designed for a family vacation that spans a week and two weekends. There are literally hundreds of things you COULD do while in San Diego, and if you have special interests, by all means indulge them. These suggestions are designed to give you a look at some of San Diego's many faces and a chance to visit some of the special Southern California places of interest. Sometimes the best things on a vacation are the ones you find by surprise. Don't take this itinerary too seriously. If the roses are blooming stop and smell them! Spend the day at the beach or relax by the pool. Or play golf. This is a vacation - don't exhaust yourself! Day 7 - More Animals! Relax. Rest. Pack. You have to go home today. Parents of very small children may want to substitute Legoland for Sea World or the Wild Animal Park. Children of all ages love the zoo, though. 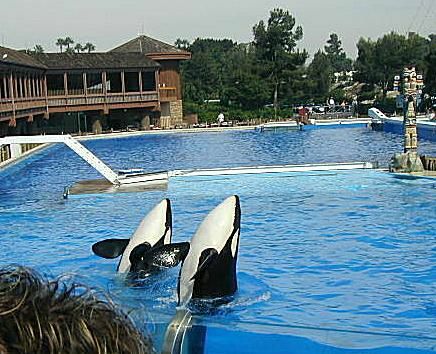 If you object to visiting wild animals in captivity, substitute one or more of these for the animal days: a trip to Balboa Park's museums, a tour of San Diego's Spanish missions, or even a day trip to Disneyland in Orange County (about 2 hours away). Many thanks to the About Guide to California for Visitors for providing the preceding itinerary to assist our Phoenix area residents with their trip to San Diego.